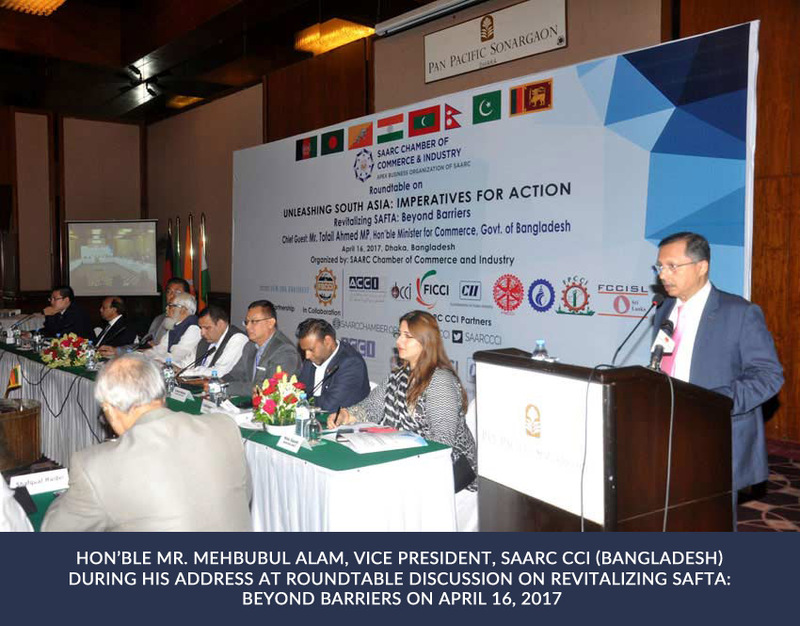 SAARC CCI organized a roundtable seminar on Unleashing South Asia: Imperatives for Action - Revitalizing SAFTA: Beyond Barriers on April 16, 2017 in collaboration with Federation of Bangladesh Commerce and Industry (FBCCI), in partnership with Friedrich Naumann Foundation (FNF). The seminar commenced with the welcome note of Ms. Hina Saaed, Executive Director SAARC CCI who thanked the hon’ble guests and participants from the SAARC member states for their valuable presence. The seminar was graced by key panelists including Mr. Md. ShafiqulIslam, Additional Secretary (FTA), Ministry of Commerce, Govt. of Bangladesh, Mr. Taimur Tajammal, Joint Secretary, Ministry of Commerce, Government of Pakistan, Mr. Ahmed Karim, Third Secretary, Embassy of Afghanistan, Dhaka, Bangladesh, Mr. Damong, Counsellor (Trade), Royal Bhutanese Embassy in Dhaka, Bangladesh, Mr. Suleman Khan, Commercial Counselor, High Commission of Pakistan in Dhaka, Bangladesh and Dr. Khondaker Golam Moazzem, Research Director, CPD, Bangladesh, Mr. Sanjeev Nandwani, Former Additional Director General, Foreign Trade & Development Commissioner, Falta Export Promotion Zone, India, Mr. Kithmina Hewage, Research Officer, Institute of Policy Studies, Sri Lanka, Mr. Kshitiz Dahal, Research Officer, South Asia Watch on Trade Economics and Environment (SAWTEE), Nepal. 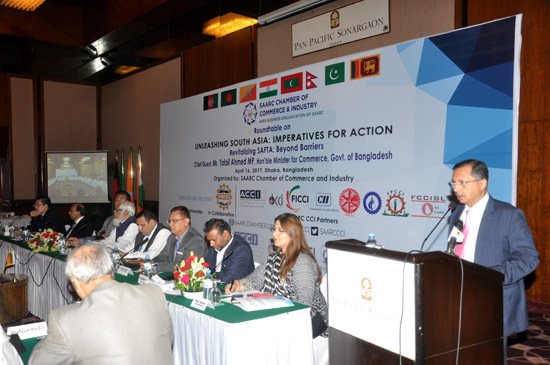 Hon’ble Mr. Mehbubul Alam, Vice President, SAARC CCI (Bangladesh) during his address emphasized on intra- SAARC trade performance. Mr. Suraj Vaidya, President SAARC CCI in his address applauded the success of 68th Executive Committee meeting held in India and Pakistan. 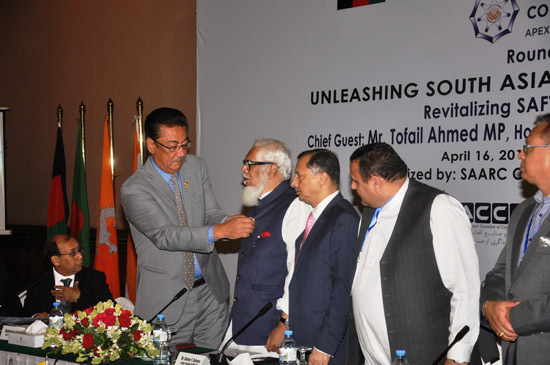 He further shared; the activities that took place earlier including meetings with ministers, business leaders, political parties and governmental officials to move SAARC forward. said Mr. Suraj Vaidya, president SAARC CCI. 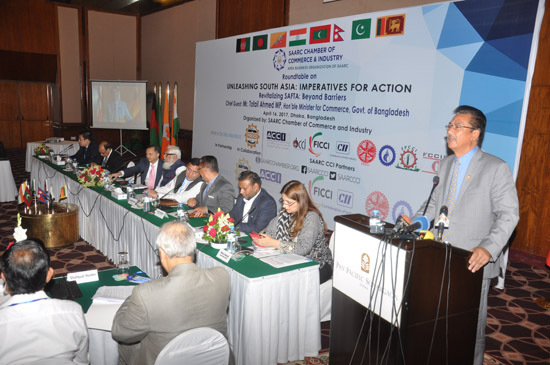 Mr. Vaidya reassured that despite all the obstacles and hurdles, the private sector of SAARC firmly stands with all the member states in taking the objectives forward. 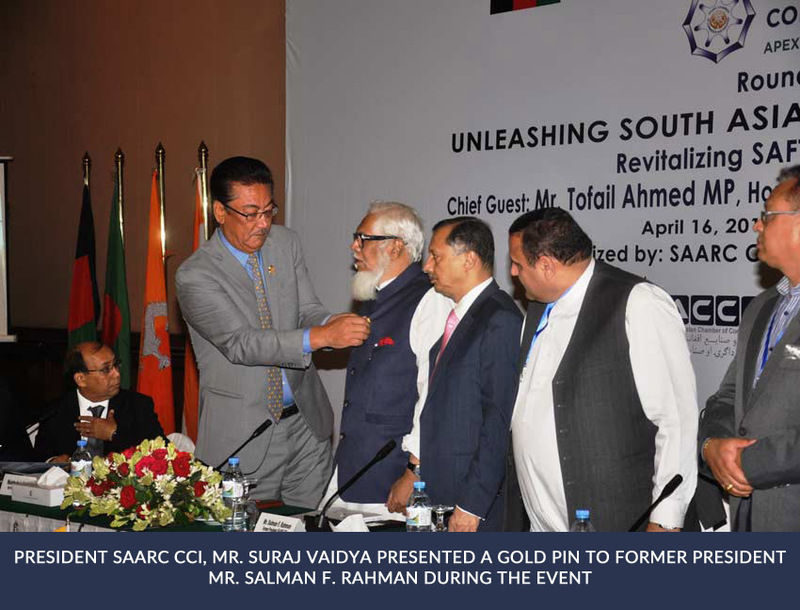 During the Seminar, Mr. Salman Rahman, Former President, SAARC CCI, was presented with a token of appreciation for his relentless efforts to SAARC and taking SAARC CCI forward by Mr. Suraj Vaidya, President, SAARC CCI. 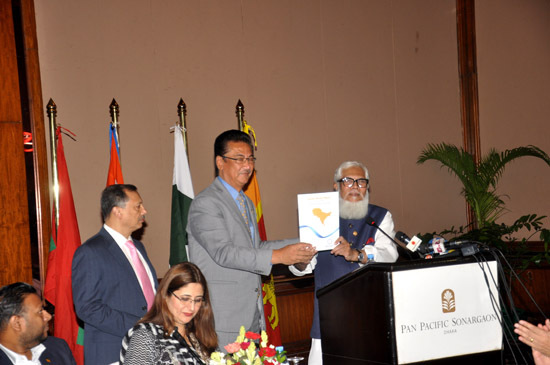 During the event, Mr. Suraj Vaidya and Mr. Salman F. Rahman jointly launched a publication of SAARC Chamber of Commerce and Industry, “SAARC Investment Outlook”. The study comprises of 110 investment projects, encapsulating different sectors of the economy from each of the SAARC member country. 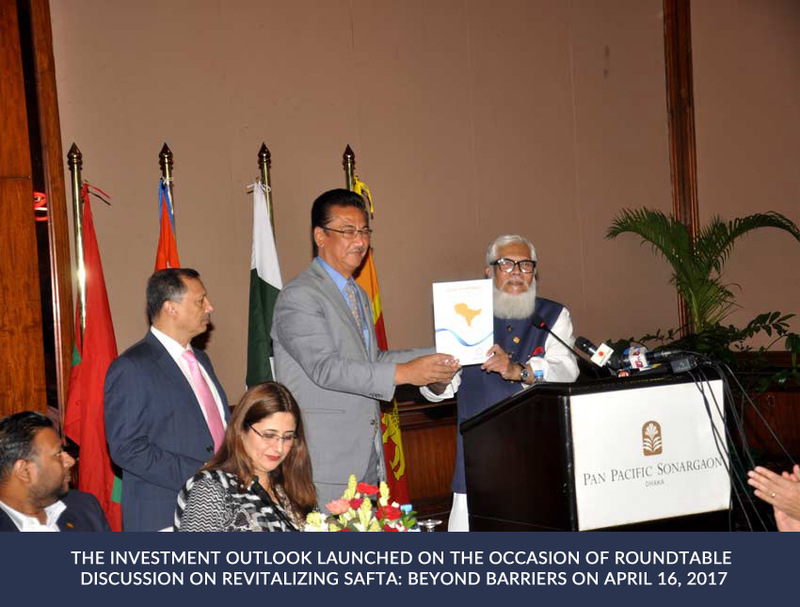 SAARC Investment Outlook showcases and brands the economic potential of the South Asian region to attract investments and investors from the region and beyond. It provides the investors with the pertinent information to initiate business.